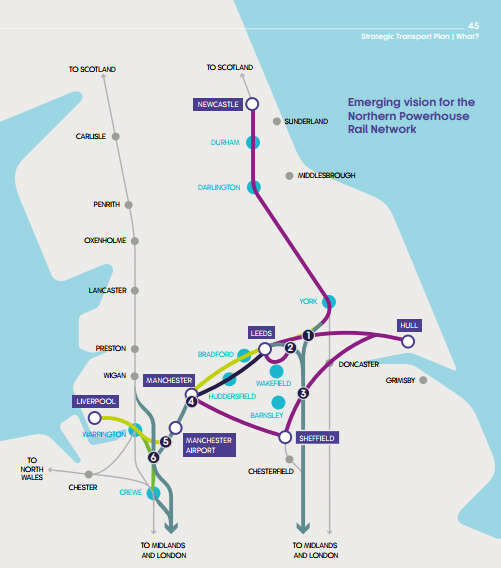 Transport for the North (TfN) has set out its final plans for a £70bn 30-year transport investment strategy. The strategic transport plan outlines a range of strategies and schemes to boost connectivity in road, rail and local transport, as well as developing smart ticketing and appraisal and governance strictures. Britain's first and only statutory sub-national transport body, which is responsible for coordinating plans for the North, has called for £2bn-£2.3bn to be spent on strategic road and rail infrastructure every year until 2050. 'Assuming the levels of committed strategic transport funding, primarily through Highways England’s Road Investment Strategy and Network Rail’s Control Period, in this Parliamentary cycle are continued from 2020 through to 2050, this could equate to around £39-43bn investment in the North,' the report states. 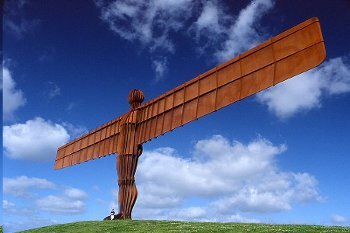 Barry White, chief executive of TfN, said: 'Our Investment Programme outlines how an additional investment of just £50 per person in the North, per year, could play a part in unlocking a £100bn increase in economic activity and create 850,000 new jobs. The Plan is due to be considered by the TfN Board on Thursday 7 February 2019. The roads that will comprise Government's Major Road Network (MRN) have yet to be announced. These would be strategic local roads that would receive funding under the ringfenced VED roads Fund from 2020. TfN has identified its own MRN for the North – representing about 7% of the roads in the North. Journey reliability – where 90% of journeys of 15 miles or more on the MRN should be delayed by no more than 15 minutes for a journey of 60 minutes expected travel time. Network efficiency – aiming to optimise the efficient flow of passengers and goods on the MRN and through the improved flow of traffic, and support for new technologies to reduce emissions of pollutants and greenhouse gases. Network resilience – aiming to reduce the number of incidences of closure of MRN routes leading to severe journey delay. Journey quality – improving the customer experience of using the MRN, including the quality and availability of travel information. Plans for a Trans-Pennine road tunnel underneath the Peak District were previously found to be prohibitively expensive. However TfN has been working on alternatives. The strategy states: 'To date, this work has found that the most promising alternative option is a partially tunnelled route on the line of the existing A628, with a supporting package of wider road connectivity enhancements, including on the M60, M67, M1 and M18/A1, which would have road user and economic benefits for the Sheffield City Region, Greater Manchester, and the wider Northern economy. Leeds to Manchester target journey time of 40 minutes. York to Manchester target journey time of 62 minutes. Capacity for six inter-urban services per hour for trains of eight carriages, and up to two local services per hour, in both directions. 92.5% of passenger trains to arrive within 5 minutes of the scheduled time. W10/W12 gauge clearance and provision of one freight path per hour (in each direction) for freight services. Upgrades to stations along the route. Improving the capacity and frequency of links between Liverpool and Manchester Piccadilly via Warrington and Manchester Airport using the HS2 infrastructure and a new integrated Northern Powerhouse Rail/HS2 station. A new hub station at Manchester Piccadilly. Faster links between Manchester, Huddersfield, Bradford and Leeds. Significant upgrades along the corridor of the existing Hope Valley Line between Sheffield and Manchester (via Stockport). Leeds to Sheffield delivered through HS2 Phase 2b and upgrading the route from Sheffield to/from the North. Leeds to Newcastle via a junction off HS2 and significant upgrades to the East Coast Mainline corridor (via York, Darlington and Durham). Significant upgrades to the existing lines from Leeds to Hull (via Selby) and Sheffield to Hull (via Doncaster). TfN aims to deliver an 'account-based' back office travel solution by 2020, which would allows passengers to travel using contactless payment and enjoy a fair price promise on multimodal, multi-operator journeys across the North - meaning they would pay the lowest fare at the end of the day or week. TfN is also seeking to have more control over its own long-tern finance, through responsibility for what it called 'a combined regulatory settlement for strategic transport investment in the North'. If this approach was implemented, the report outlines various methods to 'managing programme risk that would usefully act as a proxy for TfN sharing the financial risks of the programme'. TfN managing modal or pan-modal budgets within a fixed envelope over a spending cycle or other time period to be agreed. Cost overruns at a programme or project level would need to be managed within the fixed budget. TfN has also developed a Funding Framework that sets out parameters for the allocation and management of the financial resources. Working with the Department for Transport, it also states that 'significant progress has been made in developing a new Analytical Framework'. This framework would not only support investment priorities but would also help 'establish and maintain appropriate governance structures to build and maintain confidence in the Analytical Framework, especially of TfN’s Constituent Authority Partners and the Delivery Partners (Network Rail, Highways England and HS2 Ltd)'. 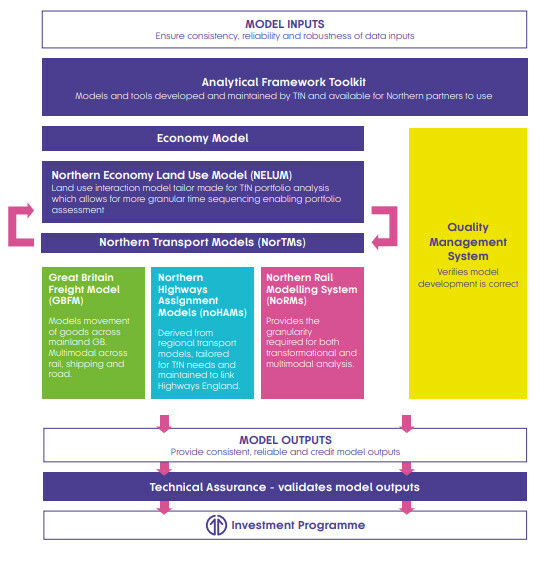 Feeding into this, by way of testing various investment plans, TfN has produced a Northern Transport Demand Model that estimates how changes in employment, population and the transport network could affect travel patterns across the North. These tools are designed to ensure TfN can move to a 'vision and validate' investment strategy that overcomes the limitations of traditional predict and provide approaches, which found it difficult to plan for transformation growth schemes, without levels of growth also ready being recorded.